This essay, which was originally delivered at the March 1998 conference, Charles Dickens and His Work, at the Middle East Technical University, Ankara, Turkey, and then placed on the conference website, has been graciously shared with readers of the Victorian Web by Laurence Raw, British Studies Manager, The British Council, Turkey. At the beginning of A Tale of Two Cities (1859), Dickens once again expresses his concern. The novel opens in 1775, with a comparison of England and pre-revolutionary France. While drawing parallels between the two countries, Dickens also alludes to his own time: "the period was so far like the present period, that some of its noisiest authorities insisted on its being received, for good or for evil, in the superlative degree of comparison only" (1; bk. 1, ch. 1). The rest of the chapter shows that Dickens regarded the condition to be an 'evil' one, since he depicts both countries as rife with poverty, injustice, and violence due to the irresponsibility of the ruling elite (1-3; bk. 1, ch. 1). As the novel unfolds, however, England becomes a safe haven for those escaping the violence perpetrated by the French Revolution. In this paper, I shall argue that A Tale of Two Cities reflects the popular confidence in the stability of England in the eighteen-fifties, despite Dickens's suggestions at the beginning. A Tale of Two Cities thus becomes a novel about the England and the English of Dickens's time. And yet, many people today would believe that the novel is essentially about the French Revolution, which brings me to my second point. If in the nineteenth century the novel served to affirm the stability of Britain, in this century it has been greatly influential in the formation of the popular image of the French Revolution, mainly thanks to film and television adaptations. The purpose of this paper is to look at the popular reception of the novel from the time of its first publication in 1859 to the nineteen-nineties. overturned on the Continent, England's remained secure .
. The clinching proof came three years later[in 1851], when throngs of workingmen and their families, among them many erstwhile Chartists, poured into London to see the Crystal Palace. Despite predictions of rampant crime and disorder, nothing untoward happened; "the people"
What, then, could A Tale of Two Cities signify for Dickens's readers, if the writer's fears of a massive uprising similar to the French Revolution appeared groundless? The answer may be found by a closer look at the contrasts, and not the similarities, between France and England as they are depicted in the novel. Rather than drawing readers' attention to the current problems of the country through a comparison with the condition of pre-revolutionary and revolutionary France, these contrasts serve to reaffirm the stability of England. To illustrate, when Lucie Manette finds her father Dr. Manette in Paris after his eighteen-year imprisonment in the Bastille, she tells him that they will "go to England to be at peace and at rest" (44; bk. 1, ch. 6). Charles Darnay, while explaining his decision to renounce his title and privileges as a member of the aristocratic Evrémonde family, refers to England as his "Refuge" (119; bk. 2, ch. 9). Jarvis Lorry complains about the difficulties of communication brought about by the Revolution between the London and Paris branches of Tellson's Bank: "At another time, our parcels would come and go, as easily as in business-like Old England; but now, everything is stopped" (226; bk. 2, ch. 24). In contrast, France becomes more and more dangerous as the novel unfolds. The acts of violence committed by the revolutionary mob are among the most memorable scenes in the novel. 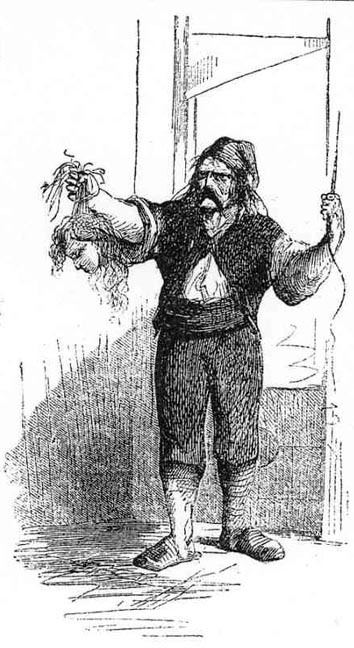 To give but one example, when the Bastille is stormed, the mob kill the governor "with a rain of stabs and blows," and Madame Defarge decapitates him "with her cruel knife" (209; bk. 2, ch. 21).
" (298; bk. 3, ch. 9) is one of the best examples of the feeling of revulsion that is associated with Paris and its people throughout the novel. Nor has the novel shown any characters who may become the 'brilliant people' of France who will make their country rise from "this abyss" in the future. Dr. Manette comes closest; he has suffered the evils of both the ancien régime (a term referring to the rule and the way of life in France before the Revolution) and revolutionary France, but his future is clearly with his daughter and son-in-law in England. 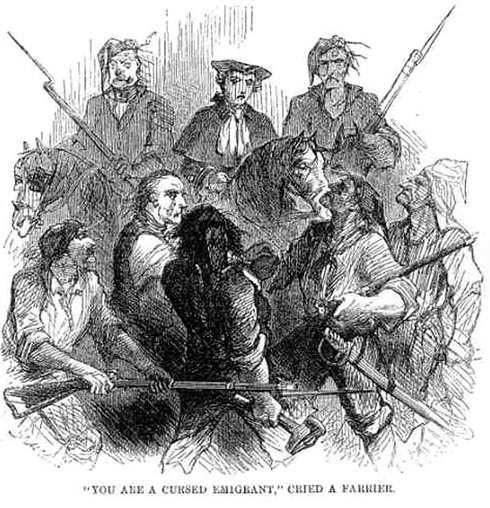 None of them is likely to return after their escape, not only because it will be politically unwise, but also because a happy and safe future awaits them in England, as Carton prophecies: "I see the lives for which I lay down my life, peaceful, useful, prosperous and happy, in that England which I shall see no more" (357; bk. 3, ch. 15). The future awaiting the "villains of the piece," on the other hand, is death in France. In the penultimate chapter of the novel, Madame Defarge, who has been driven by a desire to see each and every descendant of the Evrémonde family executed, dies by accidentally shooting herself in a struggle with Miss Pross, Lucie's faithful maid. Although the deaths of the other "villains" are not narrated directly in the novel, Carton foresees their fate on the guillotine: "I see Barsad, and Cly, Defarge, the Vengeance, the Juryman, the Judge, long ranks of the new oppressors who have risen on the destruction of the old, perishing by this retributive instrument [the guillotine], before it shall cease out of its present use" ( 357; bk. 3, ch. 15). It is interesting to note that Carton's list contains not only those French characters associated with the Revolution, but also two English characters, Barsad and Cly. Their careers as spies have finally brought them to Paris, where they work for the revolutionary French government. The pattern is one of poetic justice: the characters who have been depicted sympathetically will end up in England, whereas the villains, both French and English, will finally pay for their crimes on the guillotine in France. That the English should be proud of their country and nationality, which finds its most straightforward expression in Miss Pross's words, is a message which many of Dickens's contemporaries would readily endorse. The merit of such a message becomes unquestionable when considered in relation to a historical eventi.e. the French Revolutionwhich is depicted as pure and simple carnage. As John Gross points out, the novel "doesn't record a single incident in which it [the French Revolution] might be shown as beneficent, constructive, even as tragic" (191). 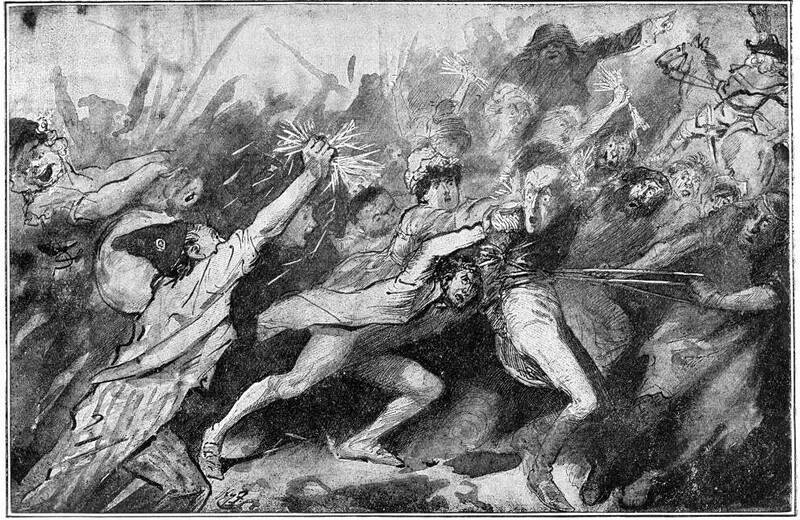 The End of Foulon by Harry Furniss. 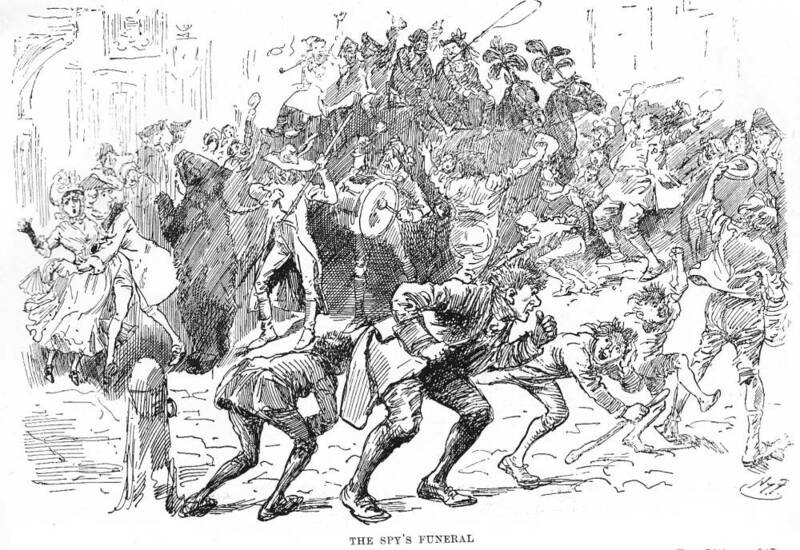 It is a commonplace of Dickensian criticism that the writer was influenced by Carlyle's The French Revolution in A Tale of Two Cities. 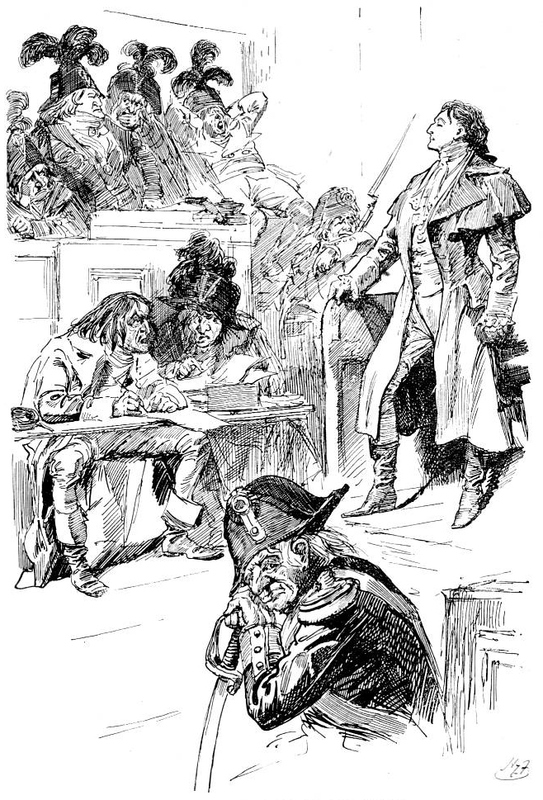 Taking Dickens's comment that he read Carlyle's history "five hundred times" (I. Collins 46) as a starting point, many critics have discussed Carlyle's influence on several aspects of the novel, such as the narrative technique (Friedman 481-5), the imagery associated with the Revolution (I. Collins 52; Baumgarten 166; Lodge 131-2), and the narration of the historical episodes (Lodge 134; Friedman 489). And yet, Dickens's outlook on revolutionary violence differed significantly from that of Carlyle. 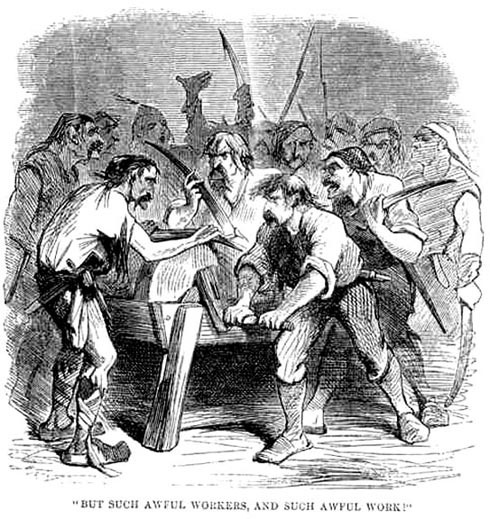 As Irene Collins points out, Dickens "dislikes the violence of the revolutionaries, both in its popular form (the mob) and in its institutionalised form (the Terror). Unlike Carlyle, he can no longer see justice in the violence" (53). Moreover, it is Dickens's novel, rather than Carlyle's history, which is responsible for the popular image of the French Revolution in England in our century, not least due to the popularity of A Tale of Two Cities on film and television. The most famous adaptation of the novel is the 1935 MGM production, directed by Jack Conway. The film capitalised particularly on scenes depicting the revolutionary mob: the film critic Derek Winnert describes it as "a wildly extravagant production" with "17000 extras in the Paris street scenes" (1009). The novel was again filmed in 1958 by the British director Ralph Thomas. This production again used a "lavish staging" (Winnert 1009). The novel has proved to be a popular source for television adaptations as well: it was adapted in 1980 and 1989, the first being an ATV production directed by Jim Goddard and the latter an Anglo-French production directed by Philippe Monnier. A Tale of Two Cities promoted the image of a stable England by using revolutionary France as a setting to highlight the contrasts between the two countries, although Dickens seemed to believe in the eighteen-fifties that England was heading towards an uprising on the scale of the French Revolution. In the twentieth century, we see the French Revolution used as a 'lavish' setting in film and TV productions of A Tale of Two Cities. In the preface to the novel, Dickens says "It has been one of my hopes to add something to the popular and picturesque means of understanding that terrible time" (xiii). It seems that, through the popular media, our century has fulfilled Dickens's intention, perhaps even more so than the previous century. What remains to readers and film/TV audiences is to decide whether this 'popular and picturesque means of understanding that terrible time' through A Tale of Two Cities does justice to that momentous historical phenomenon called the French Revolution. Altick, Richard. Victorian People and Ideas: A Companion for the Modern Reader of Victorian Literature. New York: Norton, 1973. Baumgarten, Murray. "Writing the Revolution." Dickens Studies Annual: Essays on Victorian Fiction 12 (1983): 161-76. Collins, Irene. "Charles Dickens and the French Revolution." Literature and History 1.1 (1990): 40-57. Collins, Philip, ed. Dickens: The Critical Heritage. London: Routledge, 1971. Conway, Jack, dir. A Tale of Two Cities. MGM, 1935. Dickens, Charles. A Tale of Two Cities. The Oxford Illustrated Dickens. 1949. Oxford: Oxford UP, 1987. Friedman, Barton R. "Antihistory: Dickens' A Tale of Two Cities." Dickens's Later Work: Assessments since 1870. Ed. Michael Hollington. East Sussex: Helm, 1995. 481-503. Goddard, Jim, dir. A Tale of Two Cities. ATV, 1980. Gross, John. "A Tale of Two Cities." Dickens and the Twentieth Century. Ed. John Gross and Gabriel Pearson. London: Routledge & Kegan Paul, 1962. 187-97. Lodge, David. "The French Revolution and the Condition of England: Crowds and Power in the Early Victorian Novel." The French Revolution and British Culture. Ed. Ceri Crossley and Ian Small. Oxford: Oxford UP, 1989. 123-40. Monnier, Philippe, dir. A Tale of Two Cities. Granada TV/Dune Production, 1989. Thomas, Ralph, dir. A Tale of Two Cities. Rank, 1958. Winnert, Derek. Radio Times Film and Video Guide 1995. London: Hodder and Stoughton, 1995. Grahame Smith, "Dickens and Critical Theory"
Grahame Smith, "Dickens and the City of Light"
Nursel Icoz, "Evil Intentions are the Evil Person's Own Undoing"
Deniz Ceylan, "Intimidation and Embarrassment in Conversations of Dickens' novel"
Valerie Kennedy, "Three of Dickens' Marginal Women"
Anthony Lake, "Ghosts, bodies, selves and others in David Copperfield"